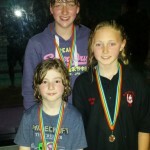 Congratulations to Team Saracens for their exceptional performance at this year’s Mavis Wallis Summer Sprints Gala. I am sure that many Saracens families watched Lauren Quigley with enormous pride as she bagged a hat-trick of medals at this year’s Commonwealth Games! It seems no time at all since Lauren started swimming lessons at Saracens fourteen years ago and although she has trained at Manchester and Stockport squads over the years, we are honoured and proud that Lauren remains a member and regular visitor to the club where her journey began.